Supreme Media Blasting of Clinton Township, MI. Media blasting for all of your media blasting needs! Searching for Media Blasting in Clinton Township or Metro Detroit? We are the premier media blasting company for Metro Detroit and the surrounding area! Why choose Supreme Media Blasting for all of your your media blasting needs? We have nearly 1,000 square feet of blast rooms and hand cabinets. We have the industry’s leading medias for just about any job, We can blast away that old finish or corrosion quickly, gently and inexpensively. 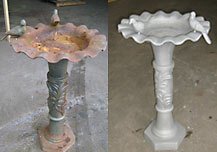 At Supreme Media Blasting, we use quality medias of many types to remove old finishes and rust. Our process gets to the surface without the toxicity of chemicals or the possible warpage that occurs with sand materials or high pressure blasting. In a word, “Quality” is the reason we are the right company to help you get your special project prepared and ready for an incredible new finish. Did you know that Supreme Media Blasting has a sister company Supreme Powder Coating ? Supreme Powder Coating can help you finish your project with a durable finish in almost any color you can think of. Another great reason to choose Supreme Media Blasting!